Accra, Palaver, Nov 5 -- THE host of experts at the Ministry of Finance, including Deputy Ministers, Special Advisers and Assistants, are all tight-lipped, on the whereabouts of the strange CNTCI Loan, from which Ghana was to receive, almost for free, millions of dollars (running later into billions), from a private company, whose location became a matter of conjecture, even in Government circles. Despite pieces of advice from the National Democratic Congress (NDC), for the Government to be more cautious, in contracting the loan agreement, the Kufuor Government, scored another “first” in public administration, by signing initial agreements, a Memorandum of Understanding, with the company, whose addresses and telephone numbers sent enquirers to strange places. Among locations found to be the headquarters of the company are a hair-dressing salon and a refugee 'camp' both in London, a super-market in Cardiff, a private home in Bermudas, and an office, found somewhere in Taipei or whereabouts. But all those pieces of information about the dubious nature of the so-called finance-bailing company, could not pull back the NPP from summoning Parliament and slotting the agreement into the agenda for its approval. The latest query from the 'Ghana Palaver' arose, out of an inter-Ministry memo, leaked to the paper, in which Ports and Harbours Ministry is being asked to forget all about any loan, coming from somewhere, to enable it implement a rail-line rehabilitation project, about which quite a noise had been made by the Ministry. According to earlier projects, listed under the expected loan – a case of counting their chicken before even a bird could be found to lay eggs – the Achimota-Tema rail-line was to be rehabilitated, in a matter of months. So also was the Eastern Line, from Accra to Kumasi, to be given a modern touch, for use by locomotives, exported from China, possibly by air, since that would cost less. There was another noise about extending the rail-line from Kumasi – spanning across the Volta, somewhere – to Tamale, Bolgatanga and beyond, to link up with another service in Burkina Faso. 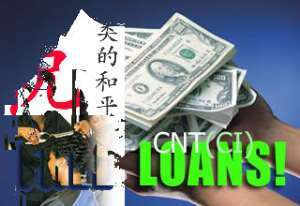 In telephone queries, on the project, no one would want to talk about the CNTCI, with the evidence pointing at the way an earlier “IFC” loan went … either shipwrecked or lost in transit. In the case of the bogus “IFC” loan, the Government was bold enough to cover up its shame and announce the suspension of negotiations on it. However, with the elections now in sight, the Kufuor Government, it appears, has ordered all its operatives to pretend to behave, as if there had never been any CNTCI business. So, when questioned on the matter, the operatives obediently hide their embarrassment, by asking for time, “to sort out things”. In a chat with a civil servant, not connected with the Finance Ministry, simply recalled the old adage that “first fool, is not a fool…” and asked us to complete the saying.